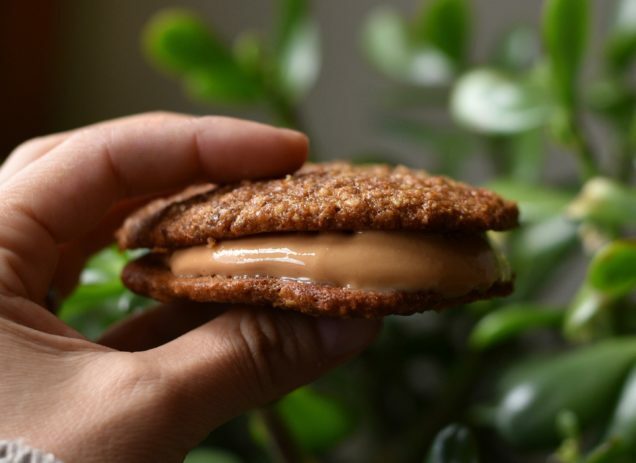 These Chewy Peanut Butter Cookie sandwiches were totally improvised using some ingredients I got from the SourceBulkFoods. I didn't expect they would turn out so darn good! The aim was to create a treat higher in protein with a lower Glycemic Index. The added peanut butter in between is of course optional, the cookies on their own are so delicious and best enjoyed about 1/2 hour after making. In saying that they will keep for up to a week ready for you to enjoy with your favourite cuppa! Combine all ingredients in a bowl until incorporated. spoon a tablespoon amount into a ball. Ensure the balls are all spaced out over a lined baking tray. The reason for this is they flatten out by themselves so there is no need for you to do this yourself. Bake for 8-10 minutes. They cook really quickly so keep an eye on the browning around edges which is an indication they are just about done. Allow to rest for 15-20 minutes before touching otherwise they may fall apart. Enjoy as a cookie or sand which between a tsp of peanut butter. Sign up and be the first to find out about fresh new recipes and events! Be one of our many subscribers who receive the latest recipes, tips and related news. We promise, we won't send any spam.